Birds fly. That’s what birds do (most of them at least). But birds don’t fly without moving their wings, because that would defy gravity. Obviously. But as you can see below, sometimes nature does mysterious things when it thinks that us humans aren’t looking. 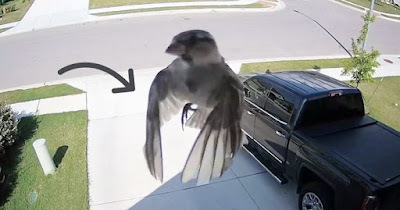 Unknown to the levitating star of this trippy video however, a home security camera caught its mind-boggling stunt on video, and it’s since been viewed over 250k times in just 24 hours after a YouTuber called Ginger Beard uploaded it to the internet. How did this little feathered fellow do it? Simple. Its wings just happened to perfectly synchronize with the camera’s frame rate, thereby creating the bizarre optical illusion that you see before you. This isn’t the first time this has happened (we previously showed you a helicopter appearing to hover through the air with its rotor blades perfectly still), but it’s the first time we’ve seen an animal demonstrating this bewildering quirk of technology. Either that or we’ve just unknowingly witnessed a rare glitch in the Matrix. What do you think?